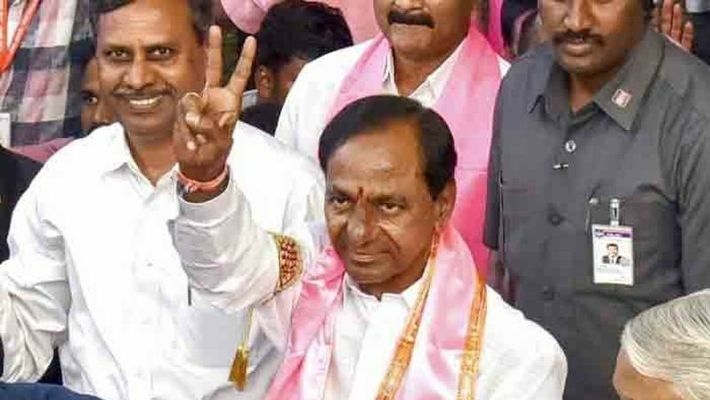 Hyderabad: Telangana Rashtra Samithi (TRS) chief, K Chandrashekar Rao (KCR), who has been elected as the legislative party leader spoke about the government formation in the state. And, he also stated that the party will have a crucial role in national politics. TRS has won 88 seats, distantly followed by other parties including the Congress, winning 19 seats and Chandrababu Naidu's Telugu Desam Party (TDP) only two seats. The BJP has won one seat. With this, it is clear that Telangana has rejected the Congress-led Praja Kutami. Rao has been elected as the leader of the legislative party by TRS members and is all set to take oath as chief minister on Thursday at 1.30 at Raj Bhavan in Hyderabad, according to sources. Earlier, elections for Telangana Assembly were scheduled along with the Lok Sabha elections. But Rao took a decision to dissolve the Assembly early and opted for polls along with other four states - Madhya Pradesh, Mizoram, Chhattisgarh and Rajasthan. The Congress formed an alliance with the TDP, Telangana Jana Samithi (TJS) and CPI and named it as People's Front or Praja Kutami. Even surveys had stated that Praja Kutami will give tough fight to the alliance. But the people have rejected the alliance and have re-elected Rao and TRS to power with a thumping majority. In 2014 elections, TRS had won 63 seats, but this time the party managed to secure 25 more seats. Alliance has cost Congress dearly in the state as the party had secured 20 seats alone in the last elections, but this time four parties together could not go beyond 21 seats. This might be a lesson to the Congress to watch out for when choosing alliance partners. If the Congress still goes ahead with the alliance, it might prove advantage to the BJP in the 2019 Lok Sabha elections. Speaking to the media, Rao said that the TRS will be a strong alternative to both Congress and BJP in national sphere. “There is confusion at the national level. Unless there is a change, the country will not grow," he said. Meanwhile, Rao’s son KT Rama Rao (KTR) too said the TRS will be a vital role in national politics. "We will play a vital role in Delhi. We should be able to influence Delhi to the extent that states will get more powers. That will change a lot of dynamics in the country," said KTR.against the TDP. This might be an indication that the TRS will be a powerful party to reckon and if the Congress continues to support to TDP during the Lok Sabha polls too, this might prove disaster for the party as the TRS is in all ways looking for a chance to defeat TDP. And with Telangana elections, the TRS has proved its might against the TDP.